When compared to linear voltage regulators the switching voltage regulators are much power efficient. In the case of linear voltage regulators the difference between the input and output voltage is just wasted and for switching regulators there is almost no such wastage and thatâ€™s why the switching regulators have great power efficiency ranging up to 85% . In simple words, the switching regulator operates by taking small bits of energy from the input voltage source and then transferring it to the output with the help of a solid state switch and a control circuitry. Since the switching element is either fully open or closed at any moment, no energy is wastedÂ across it. The control circuit controlsÂ the duty cycle of the solid state switch which in turn determines rate at which energy is transferred to the output. 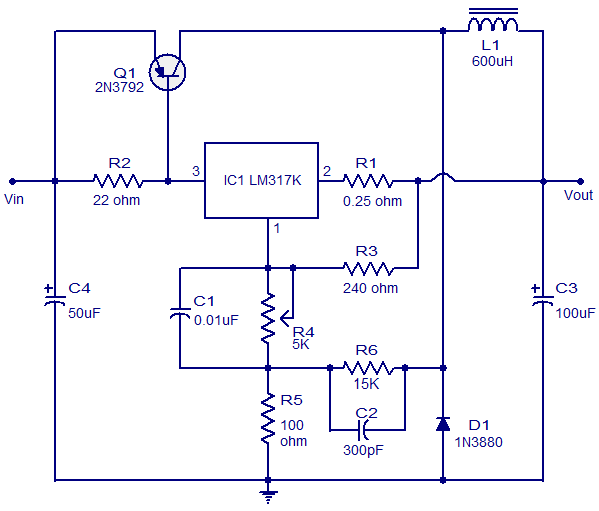 The electronic circuit given here is of a simple and low cost switching regulator using the IC LM317 that can deliver up to 3A of current. The input voltage range of this circuit is between 8 to 35V DC and the output voltage can be adjusted between 1.8 to 32V DC. The output voltage can be adjusted by using the POT R4. C4 and C3 Â must be a solid tantalum capacitor. Transistor T1 and IC1 require heat sinks. L1 can be a 600uH inductor. Hello, I’m looking to regulate voltage from a small engine charging coil for battery charging, I get between 10-16 volts DC and want to regulate it for a constant 14.5 volts. Would this regulator be suitable for my application? Thanks! Actually, this is a direct copy from the National Semiconductor LM317 datasheet, page 17. It IS a switcher… figure out how it works and maybe you’ll learn something. You have wrongly called this a switching regulator. This is a blatant mistake on your part. It shows poor knowledge in basic electronics. The LM317 is a simple three terminal adjustable linear voltage regulator, it has nothing to do with switch mode power supplies. Please correct the heading of this article. how do you modify this circuit for an output of 12V, 2A regulator. thanks, i appreciate your help for this project. linear regulator IC and you have no timing circuit. Mind you, it’s a perfectly fine circuit, but it’s not a switcher. How about a circuit using the guts of a cell phone car charger (say MC34063)with a boost transistor and larger inductor added? Where is it possible to find a 0.01uF Tantalum capacitor for a reasonable price? Can I replace it with a different type? Why must it be tantalum. It is capacitors C3 and C4 that are to be Tanatalum. C1 can be a ceramic capacitor. It was a typing error from my part. C3 is the output filter and C4 is the input filter. Tantalum capacitors exhibits very low ripple voltage and ripple voltage is a very important parameter in switching regulators. More over tantalum capacitors are very reliable and has high volumetric efficiency. All resistors can be 0.25 W. I am not sure about the R1 resistor (I see nothing function) and I feel that the R5 can be smaller (maybe 22 ohm). L1 is not critical, you can simply use the toroidal ferrite core from old AT power supply and use only the most thick wire. In the circcuit 3A SWITCHING REGULATOR, may I know the wattages of the resistors (R1, R2,R3,R5,R6) used, and how will I make personally the L1 (600uH) if I can not purchase it? I like this circuit, more power to you. Thanks a lot for this circuit..